We are so EXCITED that you decided to stop by!! We all have some GREAT things happening on our blogs to share with you. Brenda from Primary Inspired creates these AWESOME I Spy activities and one was recently spied with subtraction facts that would be just right for 2nd graders as they start the year. Click on the picture above to grab a copy. Click on the picture to participate. It will only be available from 8:00 to 9:00 pm EST! to see what else Brenda shares! Sabra from Teaching with a Twang has all the details about her GIVEAWAY right here, It is set of stations that would be PERFECT for word work . Click on the picture above from 8:00-9:00 EST to grab it for FREE! to see what else Sabra has going on these days! Cierra from Adventures of Room 129 has lots of SUPER organizing ideas for small groups and a GREAT activity with context clues. Click on the picture above to check it out. Cierra's GIVEAWAY is just what you need to get your students to begin to set their own goals. From 8:00-9:00 EST, click on the picture above to grab it! to see what all goes on in Cierra's room! Nicole from All Things Apple in 2nd is always SUPER busy sharing BRIGHT ideas! Her GIVEAWAY is a FUN way to practice Author's Purpose. Click on the picture above to grab a copy from 8:00-9:00 EST. to see what else Nicole has to offer! *These GIVEAWAYS will only be available for one hour from 8:00 pm-9:00 pm EST. After that time, they will be gone! You will then have to head over to their stores to purchase these products and check out a whole lot more! Be sure to leave a comment below to let us know that you grabbed up a thing or two tonight so we can have some kind of idea how many have been grabbed up. THANKS! 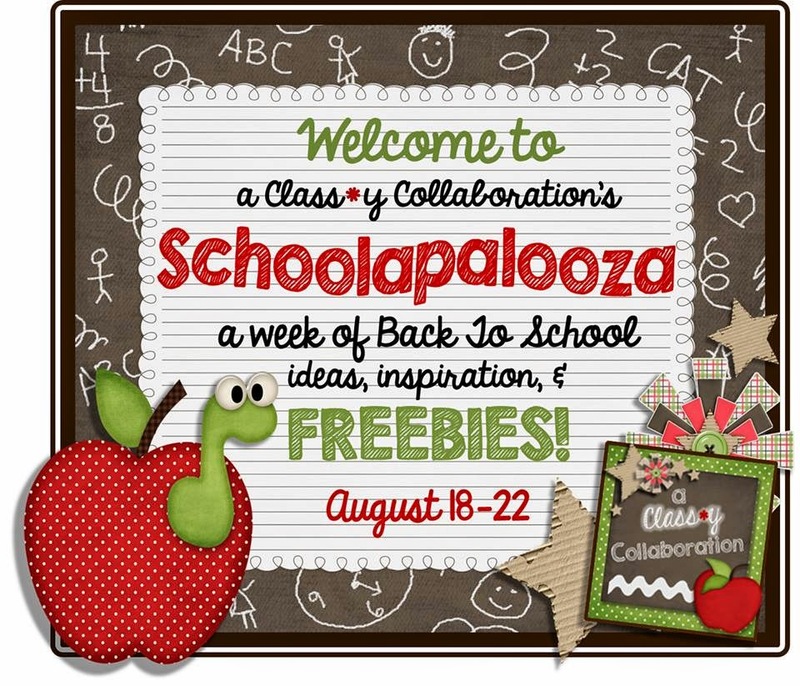 See you tomorrow for more SCHOOLAPALOOZA fun!! Yes, the time will be the same! THANKS for stopping by! Thanks for sharing, these look great! Thanks for all of the wonderful freebies! Can't wait to use these in my classroom! Thank you for sharing with us! Thanks so much! Love the freebies! Use a Clothes Pin, Save a Staple! Back to School in the Great White North! Back to School fun with Guided Math! Service Dogs in the Classroom - Meet Allen!! Icebreakin' Activities Too! Electric Boogaloo! Looking for a great way to start your art class? A *Berry* Sweet Back to School Freebie! freebies and getting ready for a new year!